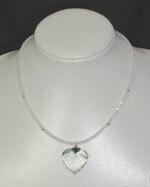 Winter was the inspiration for this 16" necklace.A cool combination of frosted white and silver beads. I have used opalescent 4mm swarovski beads for this necklace with added accents of smooth sterling silver beads.These beads compliment the focal point of a real birch leaf which has been coated in sterling silver metal making it very robust but not losing any detail. This necklace is a modern way to follow this seasons metallic trend, making it a key item in your fashion accessories.